In 1665, the Englishman Robert Hooke published an amazing book called Micrographia that contained some of the first peeks at a world that was too small to see with the naked eye. Micrographia, published when Hooke was 30, was the first publication of the Royal Society of London, and the first scientific best-seller. The diarist Samuel Pepys called it "the most ingenious book that I ever read in my life." 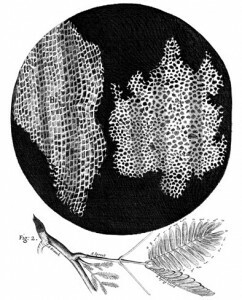 Hooke made the illustrations himself, based on what he had seen through a microscope he had built. Looking at a slice of cork, he saw divisions that reminded him of monks' cells in a monastery, and that is what he called them, "cells." Hooke was born on the Isle of Wight, home-schooled and then apprenticed as an artist. He went on to Oxford at a time of unprecedented scientific activity, and he impressed his teachers with his ability to design and execute experiments: He built the vacuum pumps for Robert Boyle, who would demonstrate that gases all act in more or less the same way. Hooke himself described how springs work in a treatise that gave rise to "Hooke's law" of elasticity. He was also an architect, and worked to help rebuild London after the Great Fire of 1666. Hooke would probably be more famous than he is had he not quarreled with Isaac Newton over some of their overlapping discoveries. When the scientific community took sides in the dispute, Hooke was shunted aside. His writings on fossils showed amazing rigor and originality. In the face of a scientific community that considered fossils a "sport of nature," Hook argued correctly that they were the remains of extinct organisms. This entry was posted in Books, History, People and tagged cells, cork, elasticity, fossils, gases, Great Fire of 1666, home-schooling, Hooke's Law, Isaac Newton, Isle of Wight, Micrographia, microscope, Oxford, Robert Boyle, Robert Hooke, Royal Society of London, Samuel Pepys, scientific best-seller, sport of nature, springs by Delia. Bookmark the permalink.